The Epicor® LumberTrack™ Software now comes with new Purchasing application programming interface. The software’s forecasting cube enables customer to load, manage and compare multiple forecast quantity models in near real-time, for up to four areas of your business. The purchasing API allows customers to extend LumberTrack software to fit their business needs. It has the ability to forecast at any level of granularity such as location, species, grade, dryness, or length and other attributes for a concise picture of the inventory. LAS VEGAS, Nov. 13, 2018 /PRNewswire/ -- Epicor LBM User Conference -- Epicor Software Corporation, a global provider of industry-specific enterprise software to promote business growth, today announced the new version of Epicor® LumberTrack™. The updates to LumberTrack software provide customers improved analytics functions that simplify both forecasting as well as the introduction of the Purchasing application programming interface (API). Also new in this latest version of LumberTrack software is a Purchasing API that allows customers to extend LumberTrack software to fit their business needs. This new feature complements the Sales and Pricing API released last year, and is part of the company's commitment to provide open solutions to the market that lets customers explore new ways to grow their business. 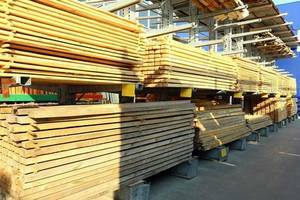 "Epicor LumberTrack software is an impressive system that revolves around the lumber business," said Chad Voyles, chief financial officer, Neiman Enterprises, an Epicor LumberTrack customer. "The software frees up time and gives us the ability to improve ship times, develop more accurate projections, and ultimately enhance our customer service." "The Epicor LumberTrack solution is used by top wood products producers, small specialty manufacturers, value-added remanufacturers, distributors, and buying groups," said Ryan Filek, product manager, LumberTrack, Epicor Software. "It's important we are able to keep up with industry needs and offer our customers the functionality they need in an easy-to-use package to help them grow their business. With the new functionality in the LumberTrack solution, businesses will be able to better analyze and forecast to reduce costs and maximize their return on inventory investment."